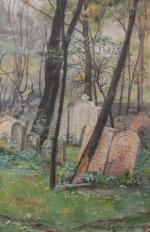 View of a old Viennese Jewish cemetery , probably the cemetery of St.Veith , where nearby lived and worked the author of the watercolour, it was executed in 1899 by famous Austrian cityscape and landscape artist Hans Götzinger (1867 Vienna - 1941 Duernstein). 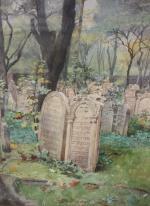 Hans Götzinger was a Viennese watercolorist whose vedute was widely disseminated in postcards, mainly around 1900. The scion of an old Viennese family was born in Vienna-Margareten, grew up in Matzleinsdorfer Street and attended the drawing and painting courses at the School of Arts at the professors Rieser, Rößler and Andreas Groll. Already due to the first exhibitions in the Künstlerhaus, acquisitions and orders took place. Götzingers watercolours were acquired in imperial possession and in public collections (mainly in the modern gallery and today´s Vienna Museum), but mainly the artist worked for the private market. Especially his Viennese motifs were sent in the form of postcards. Hans Götzinger lived for many years at the Hackinger Kai 11 and found preferred motifs in Upper St. Veit and in the Wachau as well as in northern Lower Austria. He was a member and last honorary director in the Albrecht-Dürer-Bund, experienced various honours by the City of Vienna and was awarded the title of Professor. Literature: H.Fuchs "Lexicon of austrian artists of 19th century", Vienna, 1975; General Lexicon of the visual artists from antiquity to the present by Thieme/Becker, Leipzig, 1999. Inscription: signed and dated 1899, lower right. Measurements: unframed w 15" x h 10 7/8" (38 x 27,5 cm), framed w 21 2/3 " x h 17 3/4" (55 x 45 cm).